Last heard from via the fantastic solo project 'Victorian Machine Music' is here as a four-piece from another life: 'Wintersongs' is a reissue of an earlier CDr by the label - in fact it is a reissued reissue, the original being a 1999 cassette. This handsome disc is founded on familiar compositional devices used in the most unfamiliar (or at least unexpected) ways; the disc opens with a chorus of glockenspiel, misleading my lazy ear toward a Godspeed!esque incline - but instead pulling it back in exchange for a small medley of feminine "hallelujahs", the piece never rising above the opening simmer. "Bracken" appears the official overture, with a deep, resonant guitar plucking a simple three-note melody which is joined and finished by piano, then glockenspiel briefly again; on another plane, the highest notes of trumpet have risen from behind this melody like sunshine, reminiscent the pre-jazz majesty of Debussy's 'Sunken Cathedral'. While not entirely dissimilar, the following track "Hearth pt. 1" has a pre-classical sensibility, with the folksy sound of acoustic strings played over textures of sleighbells and melodica; skillfully assembled and presented, the song could have been extracted from the choicest of guitar-centered classics (Gary Higgins, etc.). Streaks of Debussy reappear in subsequent tracks through the atmospheric glockenspiel and guitar song "Frey & Gulliburstin", a seeming variation on the melody of "Bracken", visited in a final form with closer "Tom Bowcock's Eve": trumpet calls out the melody over warm, oscillating swells and bird's song; a miniature soundscape passes through; a guitar song exits behind a curtain of chimes - in summation of the album, the track recollects the disc's varied musicality and melds them in a single, grand gesture. 'Wintersongs' is a tremendous reissue reissue, deserving to be reissued again. Rusted Rail enter the realm of the full-length CD-R release with a welcome reissue of Plinth's 'Wintersongs', originally issued in 1999 on cassette and then again in 2002 on CD-R. These 1998 recordings find prime-mover Michael Tanner collaborating with Steven DaCosta, Nicholas Palmer and Julian Poidevin, and largely pre-date Tanner's sound-works for antique music machines, most startlingly realised on the brilliant 'Victorian Machine Music' solo project. Here, more conventional instruments (glockenspiel, trumpet, clarinet, guitar, piano and melodica) co-exist with clocks, teapots, toy trains as well as electronic devices like ring modulators. The idea for 'Wintersongs' came about when Tanner re-read Lucy Boston's yuletide classic 'Children of Green Knowe', and then set about, with Steve DaCosta, to create a soundtrack to the book. After getting part way through this process, they decided to generalise it, making the work thematic of winter as a whole. All that Plinth would become is signposted in the first track 'For C.S' with its opening sample of birdsong, followed by multi-dimensional glockenspiel, then a distinctly odd chorus of "hallelujahs" comprised seemingly of androgynous voice and equipment rumble. It's a primitive sound compared to what Plinth would create later, but has enormous charm and potential. 'Bracken' is a glory of a piece, tinkling piano and dripping guitar sounds accompanied by a genuinely memorable trumpet melody. 'Hearth Pt 1' is devastatingly effective parlour folk: guitar and piano counterpoints over a substrate of barely heard bells and swelling drones. The Iditarod comes to mind, albeit brought in from the cold, thawed and comforted with mead and robust rural fare. On 'Lucia's Day Parts 1 to 3' Plinth expand their ambitions by having a crack at a near ten minute mini-suite, wielding favoured modes of metallic clatter and sonorous drone with mostly successful results. 'Frey and Gulliburstin' combines electronic crackle with contemplative percussion and guitar before dissolving into garden sounds then returning with more glockenspiel and music box ruminations. The lengthy closing suite 'Tom Bowcock's Eve' builds from subtly orchestrated drones (somewhat over-extended) through a transcendent segment for guitar, piano and melodica to a sequence of concluding chimes possibly played on icicles, possibly not. Tanner considers these early recordings na�ve to the point of embarrassment, and it's true that they are not as fully formed as his later work, but there is real beauty here, and an instinctive facility with composition and tonality, and there seems little to apologise for. This little gem from Plinth was originally released way back in 1999 on cassette and then again in 2002 on limited cdr. Featuring Michael Tanner, Steven DaCosta, Nicholas Palmer and Julian Poidevin, this is a really lovely collection of almost childlike sounds made with little music boxes, glockenspiel, trumpet, clarinet, clocks, birds, cymbals and plenty of other oddities. Imagine a style of victorian musical nursery rhyme modernised for childrens story time, lots of delicately plucked sounds blended into found sounds and childrens choirs, at times it reminds me of Virginia Astleys album "In Gardens Where We Feel Secure". Plinth come from the Dorset Paeans Collective and make a half remembered music of your dreams. The music is build from sound sources such as music boxes, music cylinder players, automated pianos and the like. Their precise yet haunting melodies overlapping in beautiful reveries. Plinth's first release has been reissued recently as 'Wintersongs' and shows brilliant music can be made by artists in the first stages of their creativity. Their rudimentary skill on early skeletal recordings becomes an asset. Minimal, childlike melodies overlap and cascade gently. Music boxes given way to children singing. This evolves into simple acoustic guitar plucks, distant pianos and trumpet. It's absolutely stunning, a music of stillness and contemplation linking Eno to Satie. Inobtrustive but moving, it connects with the listener at an instinctive level, taking us back to half remembered childhoods. There is a charm to the music, with birds, train and tea pot all quoted as instruments on the sleeve. Heard this makes sense, the music existing within a sound environment, merging with the atmosphere to become almost imperceptible. Although winter themed, this is not bleak music, instead it evokes hibernation and the sleep before renewal. Within "Wintersongs" one will find a penchant for the creation of nostalgic spaces that transport one back to an idyllic, yet somewhat melancholic childhood. Plinth employs a wide variety of high to mid-range, chiming instruments and music box-like effects. Coming up through the mix one can occasionally hear the sounds of birds chattering, an old dusty recording of a woman singing, the crackle of the fireplace and the sound of footsteps. Plinth also employs clocks, teapots, trains, garden and a variety of other non-instrumental sound makers, which adds a great deal to the completion of a full space in which their sound is able to live and aids drastically in the bands intent to create a soundtrack to Lucy Boston's children's book "The Children of Greene Knowe." This version of "Wintersongs" contains an additional 15 minutes of new material, which is intended to complete the original cycle of songs. Unfortunately the eight-year difference in recording time makes for quite a disparity in sound, though both aspects operate very well individually. The newer tracks exhibit a more mature clarity, while the originals present a rather fascinating and somewhat naive approach to sound making. As one moves through the linear trajectory of the record the shift into the newer tracks, though subtle, represents a somewhat unsettling difference that the listener is forced to deal with. This is not to say that evidence of growth should not be present, but is more a point of questioning the manner in which these sounds are presented. This may have been a drastically more successful package if the two were split onto separate discs, making it a two 3" set as opposed to the single 5", as the separation of the two states are then more readily evident. Attempting to reproduce a moment is fine, but one must always be aware that in attempting to recreate a moment one is in essence creating a new moment that may exists fine on its own, but when placed within the context of the old moment the nature of the reproduction becomes evident..
A much-needed reissue for Plinth's debut release from 1999, with a few extra tracks. Reflective melodies that paint miniature soundscapes of bucolic bliss and a similar childlike nostalgia to Colleen's recordings, particularly on the tracks of layered glockenspiel. Lovely. Dorset's Plinth appeared on the Geographic compilation You Dont Need Darkness To Do What You Think Is Right back in 2001. As the title suggests, all eight tracks on this EP were created by the 'creaking, winding, piping, chiming and wood-knocking of Victorian parlour music machines'. Though Plinth sometimes lets aged fairground/carnival tunes peek through the static, more often he uses the music machines for melancholy toy tunes, or reflective puddles of wistful melody, swamping the sweet metallic ring of the instrument with layers of machine clutter and clatter. 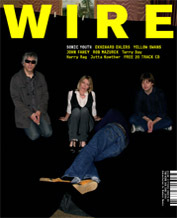 From page 60 of the June 2006 issue of The Wire magazine. 10 stars out of 10. Plinth is the solo endeavour of Michael Tanner, who is also a member of the Dorset Paeans Collective ( dorsetpaeans.org.uk ) and the A. Lords (which have a wonderful new cdr due out soon on Barl Fire) amongst others. As the title suggests, all the music featured on this cdr was entirely created from music played by Victorian machines. Between 2004 and 2005, Tanner gathered recordings from a variety of sources: vinyl, cassette archives, internet resources as well as his own recordings. In addition, he made sure surface noises and other machine sounds could be heard, all of them becoming an integral part of the music. He then set up to initiate a series of unpredictable dialogues between the recordings/ sounds he carefully selected and chose to let them do the talking instead of exercising total control over them. Tanner explains: The process tended to differ from track to track, but my favourite thing to do was take a snippet of melody from an old music box and play it back against say, a collection of notes from a parlour bell machine. This resulted in creating an entirely new melody altogether, and one that wasn't pre-planned or specific. It was if the machines were playing themselves. As you can guess, the results are simply stunning lovely, yet unsettling at times. No doubt, Tanner excels at evoking the atmosphere of a bygone era a process which, of course, operates on the most fantastical level as these sounds may resonate quite differently in our minds. Plinth thus plays machine music using musical box and other carnival-like tunes as raw material but it also plays with our sense of memory through the constant recontextualizations these elements are constantly subjected to. What strikes me every time I play this cdr is the sheer delicacy and dreamlike nature of the music. There's this whole tapestry of more or less loosely-bound melodies and ghostly textures that never exhaust their mysterious powers. Sometimes, there are moments that may recall the sound-world of C?cile Schott aka Colleen, although a closer listen reveals a different kind of approach altogether, at least to my ears. Right, the melodies do not necessarily follow a song-like structure. Sometimes, only fragments of them are actually surfacing . But this doesn?t make up for the fragile poetry that you will find here. True, the chosen medium (a three-inch cdr) makes the experience all the more concise in its overall scope and the collage method is deliberately unconventional (only one piece of software was used for the sole purpose of editing the tunes), but there is something here that just cannot be fully grasped into words. I may venture to write that, like Vashti Bunyan's oft-misunderstood lullabies, the music of Plinth is able to create a singular climate that offers as much a safe haven as a more acute awareness of the dangers that may surround us. Consequently, the dreamlike quality of the music mentioned just above is not merely lovely-sounding and it is a tribute to Tanners unique experimental edge to make us hear other unexpected voices in-between the tunes themselves. To my mind, these darker overtones are a full part of the fabric of this work and although they're not overwhelming in any way, their presence is quietly upsetting. Not a joke and not some cheap collage either - think of Colleen's last on Leaf with much more variety: gramophone, organs, music boxes, bell machines chopped, mixed and recontextualized - something like ambient music from another era. It could sound strange to some, but most of times extremely pleasant and alluring. Just awesome. Bring a pillow if you want. An enchanting release from Dorset's Plinth on new Irish label Rusted Rail in dinky purple sleeves with a paste-on picture. Recorded entirely from archive and actual recordings of Victorian music boxes, this is a magical disc of dusty chimes and ghostly melodies. Highly recommended. Plinth are a drone folk based duo from Dorset in England, all the music is sourced from either vintage archival recordings or using victorian parlour music machines, these sounds are then digitally processed to make one of the strangest releases of the year so far, organ led fairground sounds are blended with glitchy sound effects, subtle chiming sounds and delicate wind instruments, the overall effect is something that is both strange and very very beautiful at the same time, 3 inch cd in a lovely hand made card sleeve on the Rusted Rail label. Ornamental, droning, and spooky, this little album captures an antique sound that never was; pieced together from various recordings of Victorian-era gadgetry (music boxes, organs), from varied sources, by varied players. The effect is a creaky, shimmering lullaby in 8 movements, punctuated by a single moment of monologue buried deep in the dust.